There was a meeting today at the Cantine Wine Pub, with the purpose of giving an Aptos Village update for merchants in the Aptos Village area. The meeting was well attended; about fifty people showed up to learn how the project may affect their businesses. The meeting was organized by Del Crawford of Mulberry Gallery, and updates on the project were given by Supervisor Zach Friend, Mary Gourlay from Barry Swenson Builder, John Prestly, the Director of Public Works for Santa Cruz County, and Jack Sohriakoff, a senior traffic engineer also with the county Public Works department. 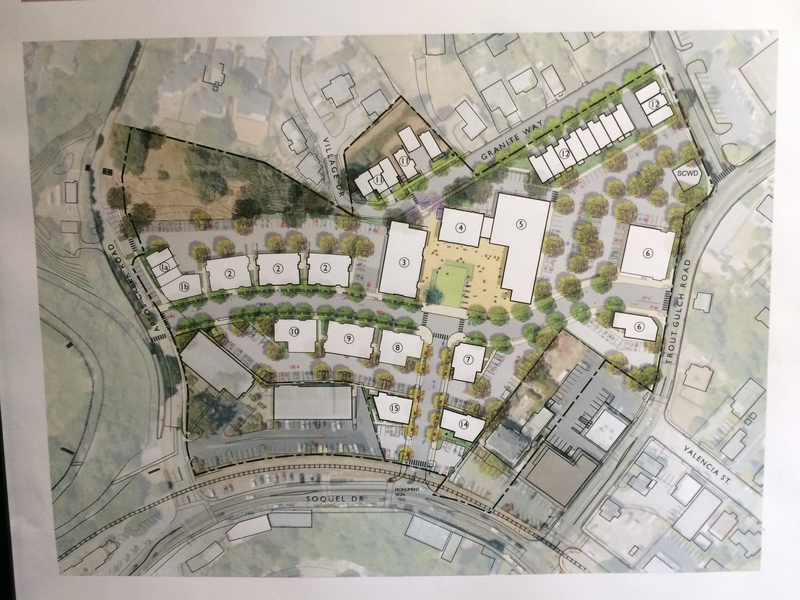 Supervisor Friend was careful to note that the Aptos Village redevelopment project has already been approved by the County Board of Supervisors, and that this project is moving forward. Indeed, Barry Swenson Builder indicated that they intend to break ground on the project “this fall,” beginning with moving the historic Hihn Apple Barn to the center of the new village and construction of a concrete pad for it and grading along Granite Way. Some time was spent discussing the fact that there have been a few small changes made to the plan, which were allowed under the scope of the approval previously granted by the Board of Supervisors. However, this small change has triggered an appeal by some concerned citizens. Supervisor Friend indicated he did not foresee this in any way stopping the project, but may cause some delay. For this reason, it is not known precisely when the project will officially break ground. Barry Swenson Builder has launched a new web site, TheAptosVillage.com, which will serve to update the Aptos community and the greater public about the project’s developments. Another meeting has been scheduled for April 22nd, from 6 PM to 8 PM, at the Rio Sands hotel. This meeting is intended for the public at large, and all are invited to attend. The public will be updated on the Aptos Village project and community feedback and input will be welcome. 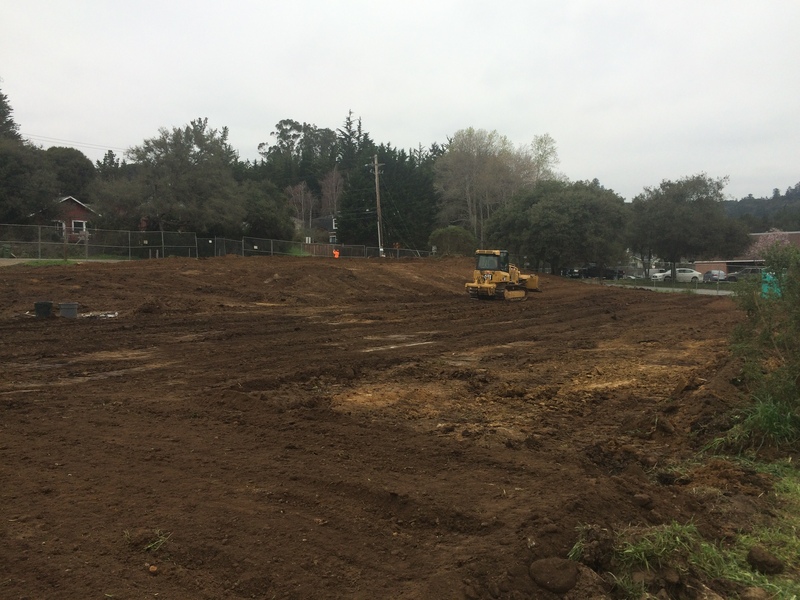 At least for the initial phase of the project, the work done by Barry Swenson Builder is not expected to have much impact on traffic flow into, out of, or within Aptos Village, as their equipment and materials will be on site and not spill over into the public streets. However, Santa Cruz County will be doing some road work projects, slated to begin in January, and this will likely have considerable impact on traffic for several months while the work is in progress. These projects include adding of traffic lights, sidwealks, and roadway improvements. It was noted that there will be no sidewalk between Soquel Drive and the railroad tracks. This was apparently part of the initial plan, as the vision of Aptos Village is one of a very walkable community. The sidewalk had to be cut because of Federal rules regarding proximity of sidewalks to railroad tracks. 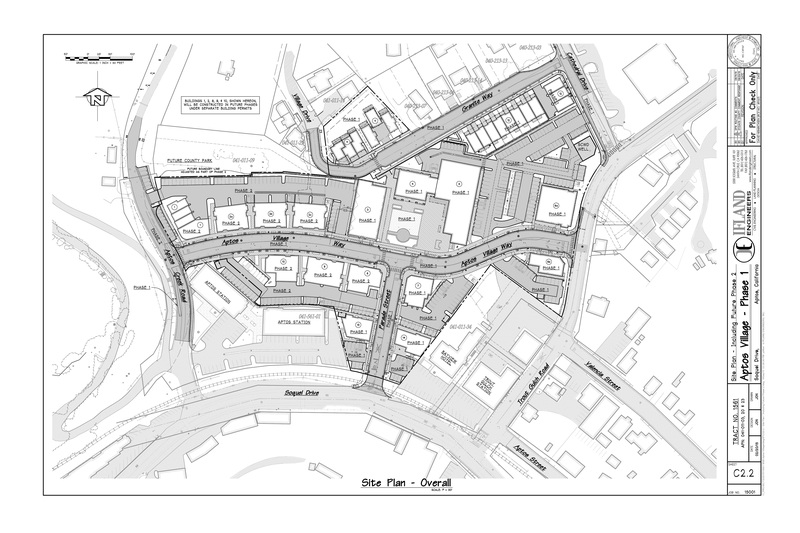 This may have the unfortunate effect of splitting Aptos village instead of creating an integrated whole on both sides of Soquel Drive. 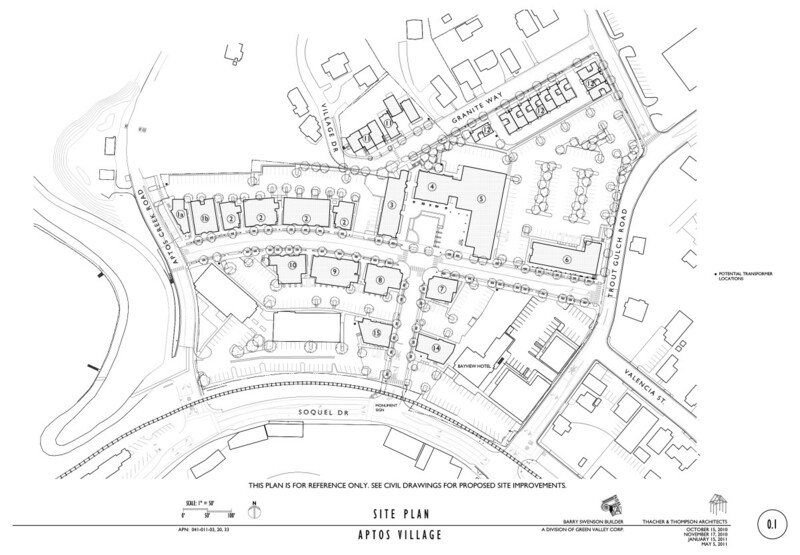 This is another example of how the presence of an active rail line running through our community compromises the vision for a walkable, sustainable Aptos Village and indeed the whole of Santa Cruz county. Today, the Aptos Post Office Jumps rode into history, as bulldozers from Barry Swenson Builders arrived to flatten the 15 year old earthen bicycle jumps. The move had been anticipated for quite some time, as it had been announced this past November that the Aptos post office jumps would be closing this February. Several members of the community have recently come together to fight the re-development of Aptos Village, and removal of the Post Office Jumps is the very first step in the process. A group of local area residents gathered on Tuesday morning to protest Aptos Village re-development. Those protesting were a mixture of mountain bikers hoping to keep the jumps open, and the area residents forming to oppose the new Aptos village. Many in the mountain biker community are reportedly at peace with the loss of the Aptos post office jumps, and are already working on finding a new home. They have built a web site dedicated to the effort, postofficejumps.org. The Santa Cruz Sentinel is reporting that Barry Swenson Builders has reached a deal with the Soquel Creek Water District to provide water service for the new Aptos Village. This is another critical milestone for the project, which is one of the largest developments in the district’s history. According to Barry Swenson Builders, residences in the new development will feature high-efficiency water fixtures and appliances, and landscaping will require little or no irrigation.